Here on Hilton Head Island, our community is very seasonal. In the Fitness world, the same holds true. While New Year’s resolutions may help us get those added pounds off after the holidays, most people forego healthy eating and more regular exercise within the first 30 days of their so-called resolutions. Since it takes at least 30 days to create a new habit, new healthy habits often go unformed and the scale and form of our frame goes right back to pre-resolution poundage by Valentine’s Day. Before we know it’s Easter, Spring Break arrived with the warmer weather and we did nothing to prep for a more active season prior St. Patrick’s Day. Then the heat is really on as we try to fit into last year’s shorts and swimsuits with little success. Making adjustments in our diet and exercise plan early enough to see the results, before the summer season serves up more memorable moments, is imperative to feel good photo ops. Start simply by drinking more water and eating three good meals a day with smart snacks in between. Portions are important. Keep them small and you’ll keep your waistline in check. Pick more protein over carbs as you incorporate weight resistance training. Increased muscle mass will assist in burning more calories. Note that you must begin making healthy changes in your diet and exercise plan at least 60 days prior to your goal date. You didn’t gain the weight or lose the muscle overnight and your body won’t change for the better in an instant either. Crunches and core work is highly encouraged, but abs really are made in the kitchen. Unless you shift poor eating habits to healthy ones and stay the course continuously, you’ll be sorely disappointed no matter how hard you work out. A commitment to more exercise combined with better eating will be necessary to ensure your healthy new eating habits can catapult your progress accordingly. Pick a time of day when you are at your peak to exercise and mix up the type of workout you engage in at least once a month. Yoga and Pilates complement one another quite well and yet, weight lifting should not be ignored at any age. Bone density is greatly improved with resistance training. Incorporating cardio training into body weight and resistance work, while remembering to stretch and focus on flexibility too, can contribute to well-rounded fitness and peak performance levels. Planning ahead for a sensational summer season physically as you explore your options geographically makes traveling to far-away places much more pleasurable. If Hilton Head Island is the destination for your vacation, let us here at The Fitness Center encourage you along in your healthy new habits. Don’t digress by skipping the workout when out of town! 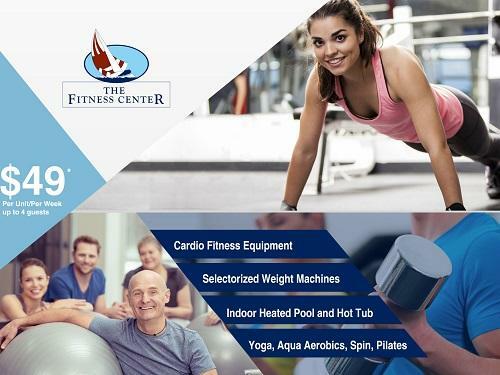 If you are staying at Spinnaker Resorts on Hilton Head Island, visit The Fitness Center, located at 35 Deallyon Ave. It has all the classes and equipment you need to keep a creative approach in your health and wellness endeavors. We are fully equipped with dumbbells, barbells, Smith machine, Nautilus, plenty of cardio and elliptical equipment and then some. We have an indoor junior Olympic size pool on site to help further your fitness fun and we currently offer 25 group fitness classes per week, all included in your membership. Come for a day, week, month or locals enjoy our facility all year round. Our variety of membership types are as plentiful as our equipment, so call us at (843) 785-3024 or stop by The Fitness Center today! Check out our Health & Fitness on Vacation Board on Pinterest.